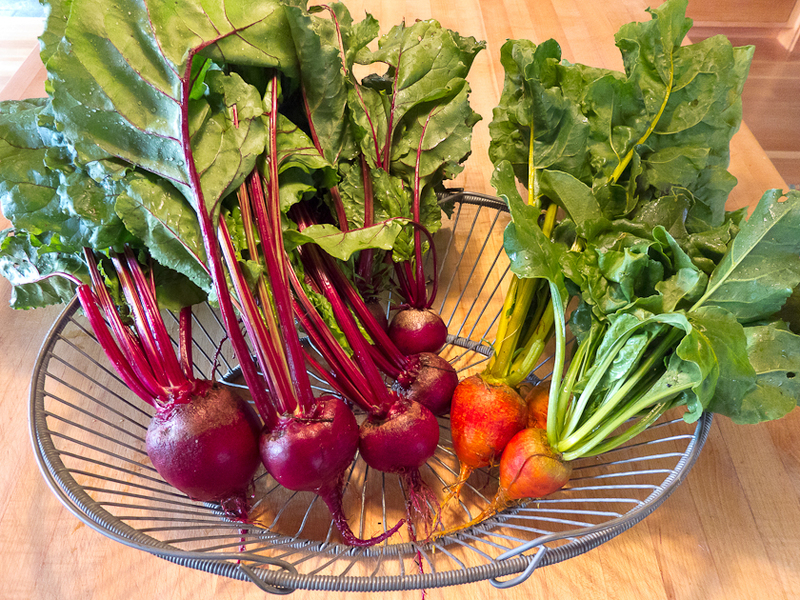 Beets are a perfect crop for succession planting. This year, I planted my first block of three three-foot rows April 26th, another block May 30th, another June 12th and a last, longer block July 23rd, a bit late but they are doing fine and will mature by late fall and hold into the winter. If I’d planted three fifteen-foot rows all at once in April or May, I can’t imagine what I would have done with all the beets. I plant both red and yellow beets. This year, the reds were Kestral and Early Wonder Tall Top and the yellow was Touchstone Gold. In the final planting I added Flat of Egypt, a red variety I planted last year and found was not only cold hardy but tasty. I look forward to both the beets and their green tops. The easiest way I’ve found to cook beets is to put unpeeled beets with two inches of stems still attached into a shallow baking dish, add an inch or so of water, cover with a lid or foil and bake in a 400 degree oven until the beets pierce easily with a knife, thirty minutes to an hour depending on the size of the beets. To cook the beet leaves, I cut them from the stems, wash them and braise them as I would spinach in a covered skillet. They cook quickly. Once the beets and greens are cooked, the quickest presentation is to slice or dice the beets and arrange them on the greens. Served plain or with olive oil and lemon or vinegar they taste sweet and earthy. But this presentation is only the beginning. Beets’ natural sweetness and firm texture make them a great complement to other vegetables in composed salads. As just one example, they are a perfect addition to the roasted zucchini salad I wrote about in the last post. There is one more delicious and unusual way to enjoy beets. 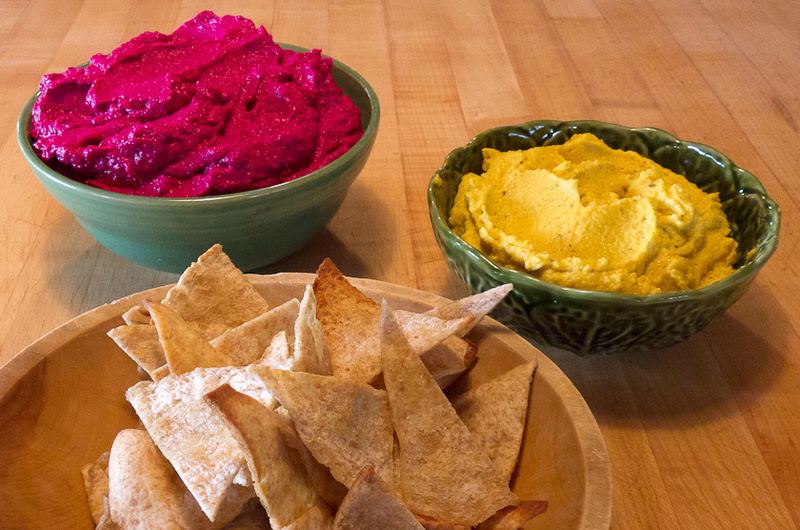 Several years ago, my friend Kathy sent me a recipe for Beet Hummus she had adapted from Bon Appetit. Wash beets, and slice in half and put on a baking sheet. Drizzle with olive oil and salt, and roast beets in a 425 F degree oven until tender. Peel, and place in processor. Add garbanzo beans, toasted almonds, and garlic. Pulse ingredients a few times to start, and then turn on processor as you slowly add olive oil until it is the consistency of hummus – thick, smooth, and creamy. Add a goodly splash of red wine vinegar, salt and pepper, and blend a bit. Taste. Add more vinegar until it is slightly piquant and pleasing to you. Transfer dip to bowl. Can be made 1 day ahead. Cover and chill. Bring to room temperature before serving with pita chips. I’ve modified the recipe over the years, using different beans—any white bean like white runner or cannellini works well—and different nuts—toasted hazelnuts add a lovely flavor. Kathy and I also sometimes use yellow beets instead of red and white instead of red wine vinegar. I use it as a sandwich spread and it’s also great as a dip for chips or for vegetables. 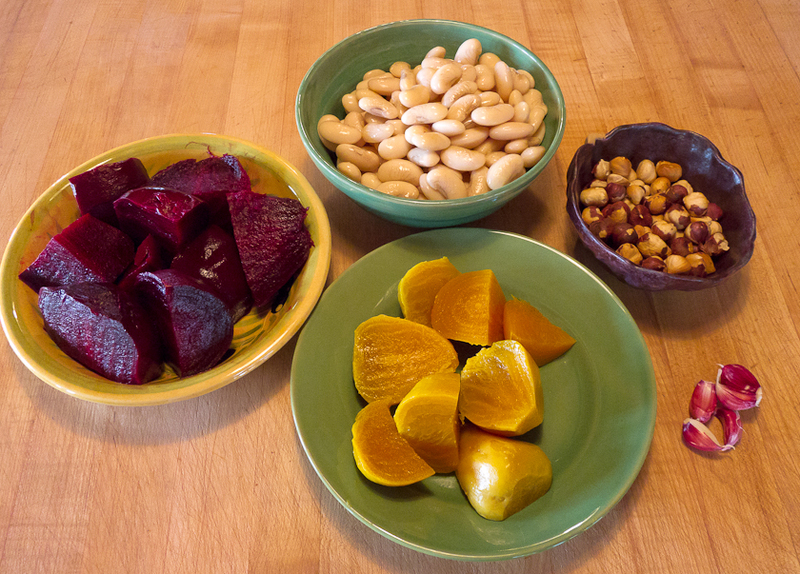 People taste this colorful dip, like it, try to figure out the flavors and then laugh when they learn it’s beet hummus. One more reason to grow beets!